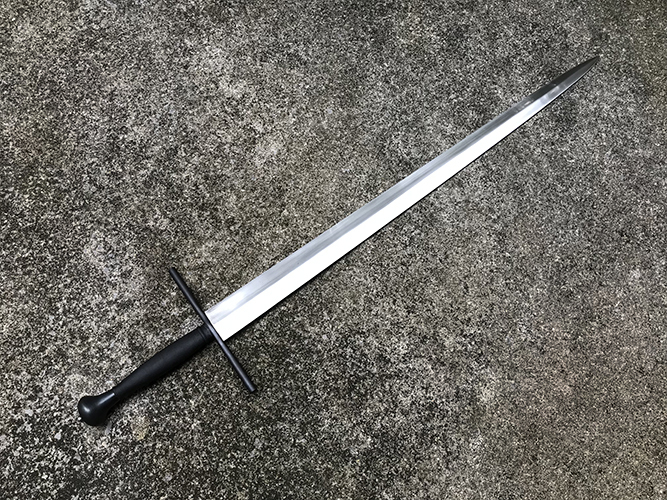 I’m losing track, but I think this is the third sword I’ve built using the Windlass “Erbach” blade. This one could have been lots of things 1450-1550, but it insisted on being this austere weapon in the style of ca. 1510-1525. 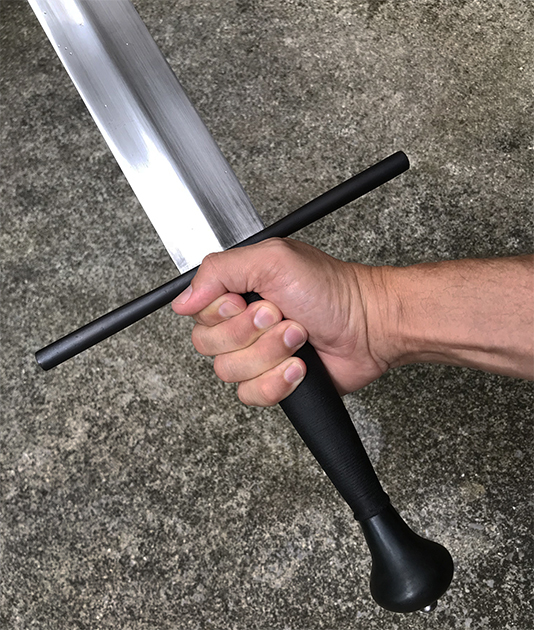 I wasn’t aiming for the wonderful Dresden sword https://myArmoury.com/talk/viewtopic.php?p=25055 but that sword certainly is a favorite of mine, so there’s undeniable influence here. The pommel was an old rough casting from A&A that needed drilling, polishing and repair of some pits. I made the cross from a discarded test tube stand. As this developed as a very severe-looking sword, I decided to leave the furniture relatively roughly finished and blue it in that state. That, plus a beeswax finish, gives a finish that looks more like fire bluing than I’ve seen in my previous applications. If you’d like to try that, beware of the wax–be sure you have everything exactly as you want it before waxing because it’s tough to remove for later applications of chemical bluing. You’ll need to heat the piece with a torch to burn off the wax, then use a strong engine degreaser. I typically blue the peen nut and peen, but for some reason felt that they should be bright here to relieve the darkness. Maybe I'll change my mind. I didn’t make a scabbard because I thought this might be displayed bare and blade-up. I might revisit that idea and make a scabbard and byknives like the Dresden scabbard. I'm sure it would impact the bluing and whatnot, but have you thought about filing and flaring the ends a little bit, and giving it a similar distal-quillon S-curve seen on the Dresden example? I feel like it would spice up the otherwise somewhat bare looking cross and integrate better with the volute on the pommel... Just my opinion though, and I don't know beans. 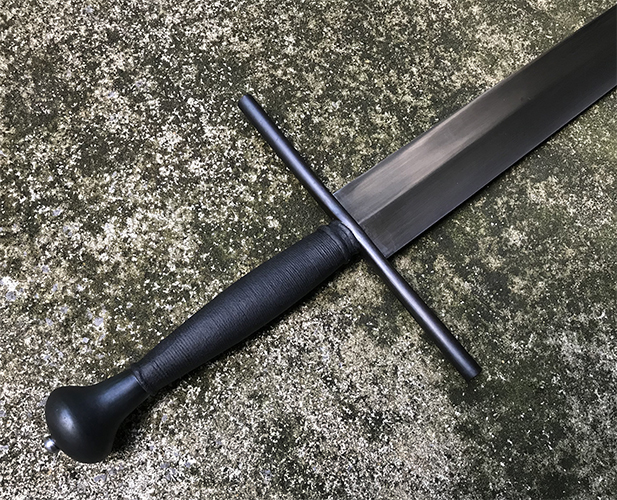 There's a very slight trumpeting effect due to spreading the middle of the guard and filing/grinding, but I, too, would have liked a more pronounced waist for the guard. One of the early ideas was for something of the previous century, and the guard would have been a better match there. Fantastic work as always, Sean. This is one of my reference images.